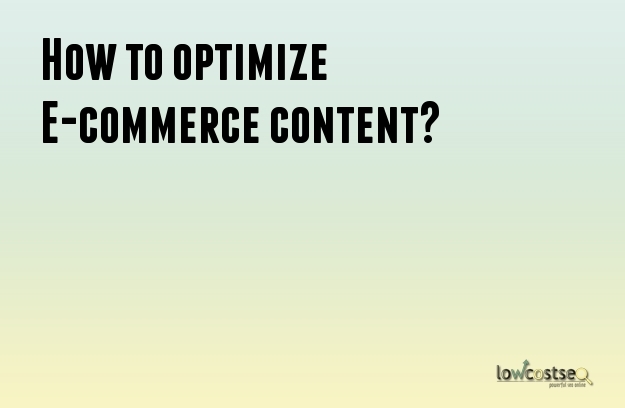 How to optimize E-commerce content? As everyone is trying to sell online nowadays, it has become imperative to optimize the e-commerce content too. While the fundamentals of Search Engine Optimization remain the same, you need to keep some important points in mind in the case of e-commerce content because it is ultimately a combination of technical accuracy and customer orientation that defines online success in this era of increasingly intelligent search engines. All the search engines are serious about user experience. If you make the experience pleasant and satisfactory, that is more likely to make the search engines happier too. Gone are the days of mechanical keyword-stuffing and link exchange. You need to build pages that provide apt product description with quality images. Also, the navigation and checkout should be as smooth as possible. Present day internet is driven heavily by images. Quality images attract immediate attention and e-commerce websites are no different. Do not just be content with a thumbnail image. Go for larger images and if possible provide multiple images with 360 degree view of the product and while doing so, don't forget to provide “alt” texts for the images with relevant keywords. Nobody reads more than a few words on the e-commerce sites. So your product descriptions need to be short and crisp without missing the important keywords. While choosing the keywords, always try to include alternative keywords that people may use for a particular product. More importantly, never forget to include them in the title and meta-tags of the product page. If you cannot figure out how to do it, never hesitate to seek technical help. Also, avoid using duplicate or copy pasted content in the e-commerce pages to save time. This one moment of lethargy can cost you heavily in the end. Any content management system generally creates the URLs by default. They contain encoded numbers or random string of letters that do not make any sense. So, edit your URLs before you publish a product page and include product name or any relevant keyword instead of random numbers. Meaningful URLs make it easier for the search engines to find your pages. If the system does not allow you to do so, you should consider replacing the same. Search engines like pages that regularly update and add new content. One way of achieving this without much effort is to allow users to do it. Allow ratings, reviews and comments by the customers to create user generated content. This will not only improve your search rankings but also make you look more reliable and genuine in the eyes of prospective buyers. Understanding how you can optimize your content on your e-commerce site can give your web traffic a boost. Although it may seem tedious to implement the above-mentioned steps, it is increasingly pertinent to provide quality in an age where a new e-commerce site is created every few minutes. At its simplest, e-commerce websites can still benefit from typical SEO services. After all, increasing their exposure and listings on search engines is a great way to reach new people. However, when you have active product listings, there are a few more advanced techniques which are worth paying attention to. When it comes to online retail, you need a more unqiue SEO strategy. Here, we will list some of the main areas you need to change or improve to ensure the best exposure. When Google crawls websites, it often ranks down websites with duplicate listings or replication pages/URLs, since this can sometimes come across as spam. The problem with extensive e-commerce sites is that the product filters can often generate different URLs to the same product. Let’s imagine you’re selling a leather jacket. That might be under an URL ending in clothes/womens/leather/product-name, or it might be under clothes/jackets/leather/product-name and numerous other alternatives. When Google sees this, it has a problem. Which page does it list on its search engine results page, or SERP? Each page is valid, of course, but if it has to spread the link juice around, nothing will benefit. On the other hand, its algorithm might just see this as spam and penalise it. The best way to avoid this is to actively fix your website to prevent this from happening – use redirects to ensure only one URL is actually valid. When you’re actively trying to sell a product, PPC services can be a great support tool. Pay Per Click ensures that you’re actively trying to entice people over to your site and, with the right keyword management, this can be highly effective. Let’s use the example of a leather jacket again. If a customer is actively searching for a leather jacket, they’re looking to possibly purchase something. Someone looking for “coats and jackets” on the other hand, is likely still at a browsing stage and hasn’t made up a more specific target item. Why is this important? Ideally, you could set your SEO campaign to target the broader terms such as “coats” and “jackets”, as this will have a big appeal and big visibility. PPC, on the other hand, will be great for “leather jacket”. Here, your PPC can be targeted to encouraging a purchase, using more specific information. If you can get people to naturally love your products, they will often speak on your behalf. There’s no better traffic than natural, organic traffic, and your outreach can be a great way to do this. If you have a key product or service you want to promote, work with bloggers and external websites. Give them sample products or special deals to entice audiences. This isn’t just a sale or advertising offer. If these bloggers really like your work, they’ll speak volumes about it. This generates hype and the links that will naturally appear will also weight in considerably on your SEO front. Similarly, when it comes to social media, you have a great platform to promote and (carefully) advertise. However you should make sure you target the right twitter followers, as like any SEO method, it’s about targeting and engaging the right people. As you can see, these methods still apply the fundamental SEO basics. However, you should always bear in mind that e-commerce websites have a different nature than generic websites, so their SEO goals will always be slightly different. This is because you’re not just looking to get views on your page – you’re looking to get specific people to convert into customers.